Glenn* has acted in some of the most significant insurance law cases in Canada, and his reputation alone is often enough to cause the other side to give up. As one of the premier insurance lawyers in Canada, Glenn covers§ mostly complex insurance litigation, as well as product liability and environmental claims. Glenn also has a keen interest in technology and electronics, keeping a handle on pretty much everything‡ to do with the law of technology and the technology of law. He doesn't just love the latest gadgets; he is a guru in e-discovery, having argued the first case before the Court of Appeal to be presented using electronic data and evidence. .
is one of the five founding partners at Lenczner Slaght. Glenn has a diverse commercial litigation practice with an emphasis on product liability and complex insurance litigation. He also has expertise in the legal dimensions of technology. 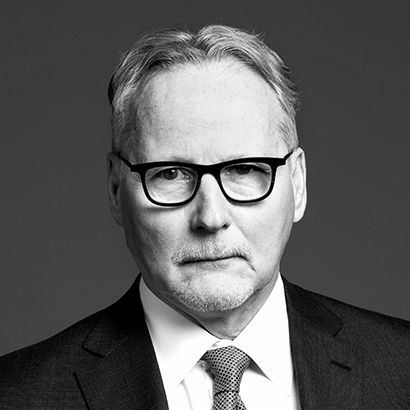 He appears regularly before a wide variety of courts and tribunals, including the Supreme Court of Canada, acting both for and against public and private companies, financial institutions and governments. Glenn is recognized as a guru in e-discovery in Canada and was on the Ontario Task Force for implementing the Ontario e-Discovery Guidelines. He is currently on the editorial board of Sedona Canada, which drafted the Sedona Canada Principles Addressing Electronic Discovery. He argued the first case before the Court of Appeal to be presented using electronic data and evidence. Glenn's practice is largely focused in insurance coverage disputes, including the complex litigation around product liability, directors and officers and environmental claims. He has been retained on some of the most significant insurance law cases in Canada, notably the Mississauga train derailment, the E. coli outbreak in Walkerton, Ontario and Alie v. Bertrand et al. He is the Canadian editor of American Re's Environmental Coverage Case Law Review, which is published annually. Glenn has a long-standing association with University of Toronto Faculty of Law. He has lectured at the school since 1981 and was head of the Trial Practice Program from 1988 to 1992. He was also an adjunct professor of civil procedure at Osgoode Hall Law School, where he taught civil procedure. In addition, he has taught civil procedure for the Law Society of Upper Canada's Bar Admission Course and was formerly section head of the Trial Advocacy Course. Glenn has frequently lectured and written on directors' and officers' liability, class actions, e-discovery, cross-border litigation and insurance law. He is also a certified mediator. Counsel in the successful defence of owner of the Toronto Raptors at trial of an action and on appeal alleging breach of contract with respect to the sale and reconfiguration of courtside seats. Counsel to the respondent in an arbitration concerning a contractual dispute and the appropriate methodology for the valuation of foreign oil reserves. Counsel to two defendants in a class action brought on behalf of taxpayers who participated in a charitable donation program. Provided expert evidence in Royal Courts of Justice on Canadian insurance law. Counsel to the defendant Canadian Wheat Board in a class proceeding by former producers seeking $15 billion in the Saskatchewan Court of Queen's Bench. Successfully moved to strike allegation made by the plaintiffs. Counsel in a dispute over historical insurance coverage for environmental damage in Manitoba and Saskatchewan. Counsel to successful appellant/respondent on cross-appeal in setting aside a finding of coverage under a directors' and officers' liability policy. Counsel for the insured Lafarge Inc in an action arising out of a complicated product liability, negligence insurance coverage action. The decision addressed a wide range of primary and excess insurance issues, and set new precedents in the insurance industry. Counsel in a claim for negligent provision of legal advice regarding a tax shelter. Counsel for the insured in an application and appeal concerning insurer's duty to investigate and defend claims arising from the historical release of contamination pursuant to historical insurance policies. Counsel for a defendant in a class action relating to an alleged price-fixing conspiracy in the market for air freight shipping services. Counsel to the defendant law firm in a class action for solicitor's negligence involving a tax shelter based on charitable donations using in part borrowed money for tax deductions. Successful response to an appeal with respect to the dismissal of an application by an insurer for a declaration defining and limiting the scope of a "Rip and Tear" exclusion in an insurance contract in a case of extensive property damage. Counsel to the primary insurer, ACE INA Insurance, in an appeal concerning the issue as to whether an excess insurer has an equitable duty to contribute to defence costs paid by the primary insurer before the primary policy is exhausted. Glenn Smith and Sarah Millar were quoted in the recent Canadian Lawyer Magazine article about the evolution of e-discovery. Glenn and Sarah discuss how e-discovery solutions have become more sophisticated and cheaper, allowing even small firms to reap the benefits. See below for excerpts from the article. Lenczner Slaght is proud to announce that Glenn Smith is one of the recipients of the 14th Annual Ontario Bar Association Award for Excellence in Insurance Law. Canada’s leading litigation firm and its expert lawyers are ranked once again by Chambers & Partners for their exceptional litigation work. Canada's leading litigation practice is once again ranked #1 in The 2015 Lexpert/American Lawyer Guide to the Leading 500 Lawyers in Canada. Canada's leading litigation practice remains in Band 1 for 12th consecutive year. Canada's leading litigation practice is once again ranked #1 in The 2014 Lexpert/American Lawyer Guide to the Leading 500 Lawyers in Canada. Lenczner Slaght lawyers recognized in the year-end Lexpert Special Edition published in conjunction with Report on Business magazine. Glenn Smith and Rory Gillis' Ontario Court of Appeal Case, Onex Corporation v. American Home Assurance Company, is recognized in Lexpert's July/August 2013 "Big Suits" edition. Glenn Smith acted on appeal for individuals fighting their insurance company relating to a 24 year old car crash. Recognized by Canadian Legal Lexpert Directory as leading practitioners. Lenczner Slaght in the top band of Canadian litigation practices. In a case arising out of a seat reconfiguration at Air Canada Centre for Toronto Raptors basketball games, Justice Beth Allen of the Ontario Superior Court of Justice has found that DLF Solutions Inc. and its principal Mark Michalkoff failed to establish that Maple Leaf Sports & Entertainment breached the plaintiffs' Personal Seat License by reconfiguring several courtside seats prior to the 2007 basketball season. In demonstrating that the plaintiffs' evidence regarding alleged pre-contractual representations was evasive and inconsistent and, by satisfying the Court that Maple Leaf Sports had in no way misrepresented the amenities associated with the plaintiffs' seats, Lenczner Slaght was successful in defeating DLF's claim in its entirety. Glenn Smith quoted in the Ottawa Citizen on potential impact of new summary judgment rule. Glenn Smith is quoted in the Financial Post regarding class actions as a means to recover lost money. Glenn Smith was a panellist at the 2018 New York State Bar Association's International Section Seasonal Meeting. He spoke on the "Insurance: Cross-Border Challenges" panel. Glenn Smith, a leading expert in Canada, commented on the latest trends in D&O risk & liability in Financier Worldwide's 2018 Annual Review. Glenn Smith will be presenting on the topic, Class Actions: Effectively Controlling Litigation Costs, at this year's American Conference Institute Forum on Oct 24th, New York City. Glenn Smith presented on the topic at The Osgoode Certificate in eDiscovery, Records Management, Information Governance and Privacy. Glenn Smith presented on Conducting Examinations in Chief at the conference sponsored by the Ontario Bar Association. Glenn Smith co-authored the article Hidden Treasure and Hydra's Heads: How Clarifying Canadian Insurance Law can Address Environmental Harm in The International Comparative Legal Guide to Insurance & Reinsurance, Global Legal Group Ltd, London, UK (2012, 2013 editions). Glenn Smith presented at Insight's Complex, Mega and Advanced Litigation Conference. Glenn Smith speaks at Canadian Institute's 10th Annual National Forum on Class Actions Litigation. The Law On Discovery and Production of Electronic Evidence: Where Are We Now? Where Are We Going? Glenn Smith presented at Osgoode Professional Development CLE in preparation for Rule changes. Glenn Smith addressed what general counsel, compliance officers and related professionals need to know about the preservation and collection of electronic evidence. Glenn Smith moderated a Panel on the topic at the CCCA 2009 National Spring Conference. Glenn Smith moderated a Panel on Ensuring Cost Effective and Compliant E-Discovery. Smith, G., Maroudas, E. and Breedon, R. "The Significance of the Alie v. Bertrand & FrC(re Decision", (2003) 21 Can. J. Ins. L. 1.